Comfortably nestling in Shrewsbury's historic town centre, The Golden Cross Hotel offers a whimsically glamorous alternative for visitors bored with the tame impersonality of chain hotels. We welcome anyone who loves character and quirkiness and has a healthy appetite for delicious food... and for life itself! An intoxicating mix of the best of contemporary interiors sprinkled liberally with shabby chic and antique glamour, our mission at The Golden Cross is simple: we offer a ‘home from home’... somewhere to hang up your hat or lay down your suitcase while enjoying a snifter of understated opulence and large measures of funky style - all at very realistic prices. We think we've made The Golden Cross into something special. But we're biased! The only way you'll find out is if you come and stay. Then you can judge for yourself. 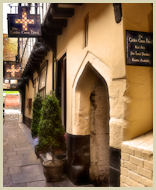 As the oldest public house in Shrewsbury, the Golden Cross Hotel has an enviably long reputation for outstanding hospitality - coming up to 700 years! Our five bedrooms are individually-crafted from the foibles of the medieval framework and luxuriously furnished in a gorgeous blend of the quirkily traditional and the deliciously contemporary. For many years, The Golden Cross has been one of Shrewsbury's most popular restaurants. We believe in real food with big flavours, simply prepared using the finest local and seasonal produce... oh, and realistically priced. Our menu changes monthly to reflect the character of the season. Dishes are lovingly constructed with layers of rich, natural flavours and combinations of contrasting textures but we don't ignore the old favourites either. And, as you might expect, we make sure our medieval cellar is well-stocked with judiciously-selected wines, local real ales and cider.